This film is based on Shichiro Fukazawa's novel and is set in the 19th century in a severely impoverished mountain village in northern Japan. In this fictional society, once the elderly have reached the age of 70 they are brought up Mount Nara, where ancient gods reside, and left to die. Imamura's rough sexual humor is still in evidence, but now it has taken on a dark tone: to make love is to flirt with death. in this hermetic world... Imamura captures a truly universal, all-encompassing experience, showing the transmission of virtues and vices from one generation to the next in the service of life's tenacious continuity. A masterpiece of the human condition...[but] below the very peak of Imamura's filmmaking powers. However you slice up postwar Japanese cinema, Shohei Imamura is one of its premiere figures. 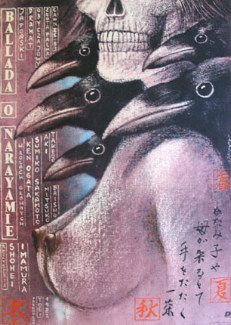 The Ballad of Naramaya is an indelible and transfixing poem of a movie that packs a substantial and complicated emotional punch. Shohei Imamura present a great tale, the struggle of a mother to accomplish all the necessity of your family, before her death. With the perfect direction, and screenplay, The Ballad of Narayma, show too the sexual perform of her sons and the violent way of life that the community live together. Narayma, bring too a strange dark humor, shocking scenes and the difficulty of a son to comply an cold tradition. Certainly, deserve win the Palme d'or in 1983. Fresh. This movie was a treat!! It has everything: humor, drama, great characters and a beautiful story. It's situated in a peasant village, where everybody has to struggle to keep the mouths of their families fed. The people are submitted to strict rules to make sure that everything doesn't spin out of control. One of the rules is that when a person turns 70, they have to be carried off to the mountain of Narayama by the eldest son where they are left to die. The story revolves around Orin, the 69 year old mother and her family, a colorful collection of characters that find their way into your heart effortlessly.